These are just a few of the January “challenges” (for want of a better word) that I saw floating around online over the last few weeks, either to benefit a charity or because people wanted a personal challenge with which to kick off 2019. And even though I saw some grumblings in the dark recesses of Twitter about how “running every day is bad for you” (seriously, what’s your damage Heather? ), I think switching up your lifestyle with a clear start and finish can only be seen as a good thing. Let’s look at the timing of the whole endeavour. Some people may argue that going off the booze or dairy in what is arguably the most difficult month of the year is a terrible, terrible idea. But think about it – if you’re going to cut things out of your life/diet, it seems like a sensible time to do it when a) you don’t have a huge amount of money to spend on such things and every drink in the pub comes with a side order of “oh gawwwwd why is payday so far away? !” and b) a load of other people are challenging themselves in the same way, so you have a ready-built support group online if not in real life. Then there’s the duration of January challenges. It’s fairly well known that it takes 21 days to make a habit, so if you were able stick it out for just the first 3 weeks you may well have made a change that’s going to become as normal to you as brushing your teeth. That’s how I’ve always viewed exercise – as a routine part of my day that I happen to really enjoy (unlike flossing – the tooth version as opposed to the dance). For me, things like Dry January and RED January don’t appeal. I usually only have a drink around once a fortnight, and I generally do a form of exercise 6 days a week as standard (although RED stands for Run Every Day, the premise is actually to do a form of exercise every day), and make sure to have a day off. My body craves rest days and would not stand up to running every day, but some folk I know have been doing that and having no issues whatsoever. Some are even pushing their 10k PBs (hi Justin!). Everyone is different, and judging folk because they’re doing something you don’t quite fancy trying yourself is just a mega time vacuum. Maybe go for a run instead? So did I do any resolutions myself? Kind of. I did Adriene’s 30 days of yoga, enjoying having a structured yoga workout “flow” its way into my inbox every day without having to spend time scrolling through her epic video library. I didn’t do every workout every day, and instead sometimes doubled up on weekends. But I did all 30 workouts in January and I LOVED it. I feel stronger and my flexibility has definitely improved. Overall, all of these challenges have something in common – they all gave people the opportunity to try something new, and in doing so, helped them to perhaps find something they love, be that clearing their minds by running, cutting meat and dairy out of their diets or taking the time to focus on their breathing for 20 minutes a day. I’m going to keep doing Adriene’s yoga every day (even if I do have to put a bit of effort in to select the video each time) and I’m glad that January gave me a reason to commit to a challenge that has made me feel flipping awesome, inside and out. I’m sure I’ve probably mentioned this before, but I absolutely hate 10k as a distance. I find them so difficult to pace, often blowing up at around 6 or 7k, and as such I’ve avoided them like the plague in the last couple of years. But then I decided that this was the year to (occasionally) go out of my comfort zone, so I’ve so far done the Ely Runners 10k handicap race, and the Marcus Gynn 10k (which was surprisingly held on the surface of the sun). And then this weekend it was the turn of the Bedford Half Marathon Weekend‘s Twilight 10k. I’ll be honest – it was the photo of the medal that first convinced me to sign up for this race. It was obnoxiously huge and shiny, which appealed massively to my inner magpie. I keep all of my medals and am always pretty disappointed whenever I do a race and find my goodie bag only has a couple of flyers and a revolting gel in it. Plus one of my favourite running buddies was going along, and we decided (ok, I basically told him) that we would run it together. When Chris, Sarah, Justin and I arrived at the running village after a bit of a schlep from the car (parking was a good mile and a half away but I didn’t mind this too much) the atmosphere was just brilliant. They had a massive welcome sign (perfect for a group photo!) a big stage with a DJ, lots of food stalls and a variety of pop up stalls including Up & Running and a local sports physio company offering massages (so I was a tad disappointed not to have any cash on me)! On Running were also there, and I visited them after I had finished the race only to find that I could have borrowed a pair of their Cloudflyers (which I’ve had my eye on for some time) to run the race in. I did do a little sprint in them (and they felt AMAZING) but it would have been great to trial an entire 10k in them, especially as they’re quite an investment pair of trainers. The event also had lots of hay bales dotted around for people to sit on, and most happily of all there were LOADS of toilets which made this nervous runner feel a bit calmer. Me, Justin, Sarah, Chris, Shaun and Emma – thanks to Chris and Sarah for the lift! The start of the race was probably the only negative part of the whole thing (other than Emma and I not being able to locate halloumi fries). They had split the (potentially 3000 runners, but only 1846 completed the race) into 5 waves, and Justin and I were in Wave 1 which was due to start at 5:30. So we got there at around 5:25 only to find they had already sent Wave 1 to the start. Cue a mad dash with little or no direction to find our way to the start which ended up being where we had just come from! I think in future they should just start Wave 1 at the actual start and have the other 4 waves in the holding area. 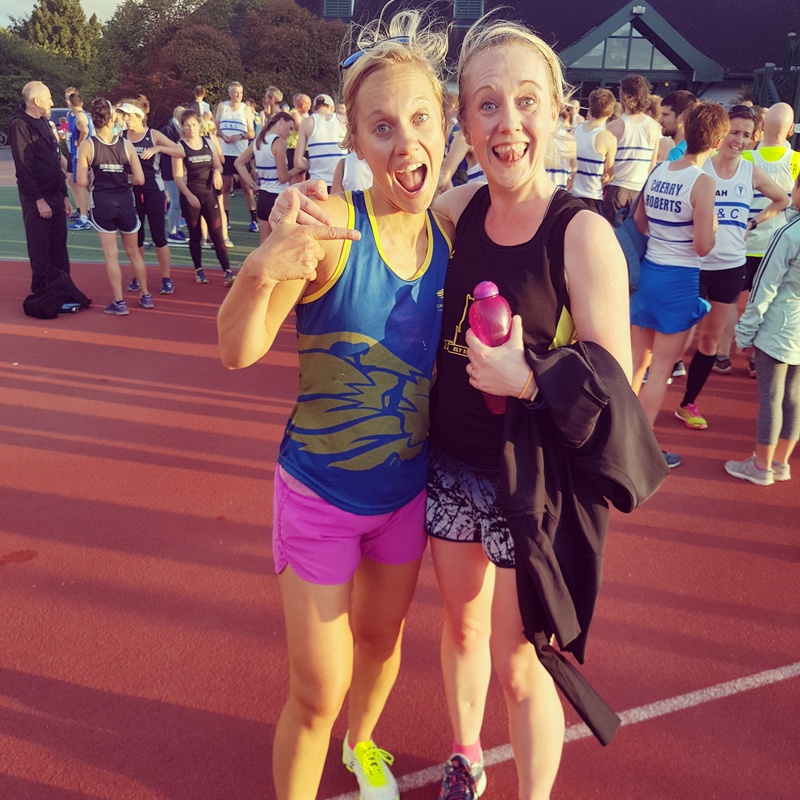 But still, at this point I got to meet the awesome Laura Brine who I’ve been following on Twitter for some time (but only realised it was her when searching for the race hashtag on Instagram on the way home!) as we all pegged it to the start. The start of the race was a little congested, and at first I thought maybe the organisers had got their wave splits completely wrong. But as it turned out, they had it pretty spot on. The largest group was those who had put their finish time as 1:00 – 1:09 (553 finishers), and our group (sub 54 minutes) had 379 people finish in that time. Of course I can’t tell how many people may have started in the first wave but finished slower than they had expected, but overall the splits seemed fairly sensible. You just have to be like Justin and be willing to scuttle past people and overtake them when the opportunity presents itself, and after the first kilometre or so this becomes easier. The course was gorgeous – there was woodland, lakes, bridges, the riverside – there was so much to look at which I found brilliantly distracting. Plus the course offered a variety of surfaces and the odd little incline which stopped my legs from getting too “bored”. The marshals were also brilliant, and I just thoroughly enjoyed the whole thing. They also had a great goody bag – the medal of epicness, a technical t-shirt that doesn’t completely swamp me and snacks like bananas and biscuits. All of this for a race entry fee of around £25 for both the 10k and the half marathon which takes place on the Sunday. I honestly don’t think I could recommend this race enough. I enjoyed it so much that I had already signed up for next year less than 24 hours later. I’m even contemplating making like Laura and signing up for both the 10k and the half in 2019, but I’ll see how my foot holds up to the St Neots half marathon later this year. So what are you waiting for? Get signed up for 2019 here – you won’t regret it.